2018-JULY-18 UPDATE: It appears Peter has shut down his rendering tool. It is no longer available. Earlier I posted a PCB Checklist of items to double-check when sending your board out to a fab. The Dangerous Prototypes blog pointed to a 3D EAGLE PCB tool from a Bulgarian-based developer called Cytec that takes an EAGLE BRD file and renders it in 3D for you. 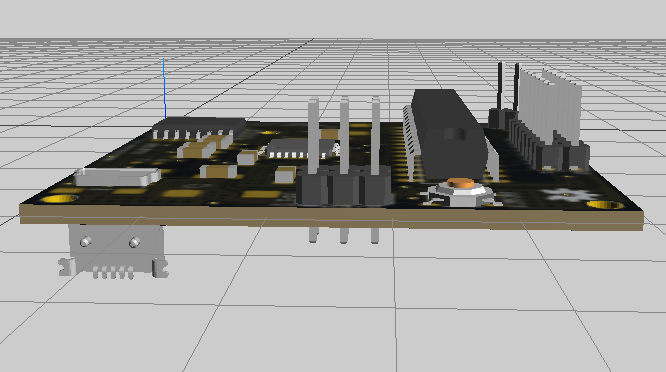 The example board I have above is a render of my MSO Demo Board. And I have to be honest, it looks much like that one! Generated from a database of 200 models, there are bound to be a few missing. Even in my case, the 1206 LED was missing, but I substituted a 0805 package. There wasn’t through-hole crystal. If I had the STP file though, it’d be no problem to upload it. As long as your browser supports OpenGL, you’ll get a nice 360 view of the board. There are some EAGLE ULP scripts to do similar things, but none are as simple as drag-and-drop on Cytec’s tool. 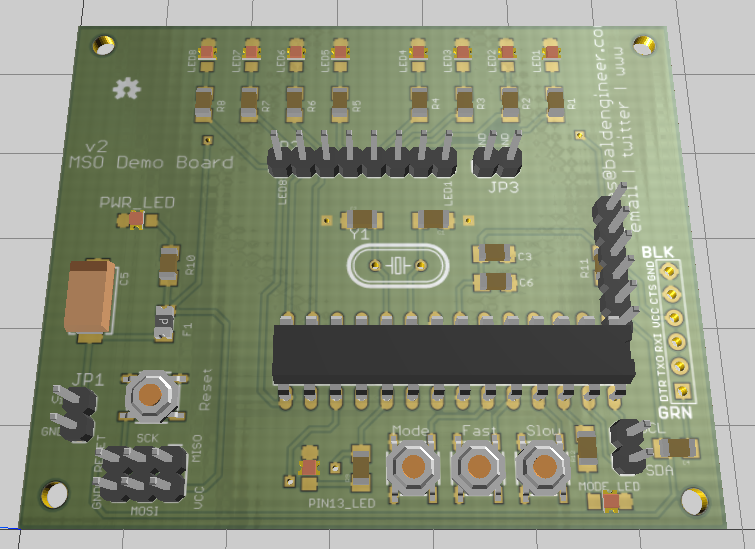 One issue I ran into, the Mini-USB Connector I use on some of my boards didn’t render correctly, here is the output from my latest revision of BinBoo. Overall though, very nice job, very easy to visualize what the final board will look like. Check out the tool on Cytec’s web site: http://3dbrdviewer.cytec.bg. He reached out to me months ago. He tried moving to a pay model, but it didn’t seem to work out. I think the work that Autodesk is doing will render his tool obsolete anyway. Though, I do miss how easy and well it worked. I dont think autodesk would make a great tool like this obsolete. Autodesk is a walled garden and a large corporate for-profit model with many barriers for setup and installation. Peter’s project was ideal for client presentations on-the-fly and quick mock-up fixes without needing to install things. It was light weight, and had good shading and other upgrades as well. I hope he brings it back some day. The pay model appeared to be optional but I would have gladly signed up for a subscription if I knew it meant the life of the project. That is unfortunate. Time to look closer at Fusion 360’s EAGLE 9 sync. There is a 3D visualisation tool developed as a workbench for the FREECAD application. The stuff is free, you are the owner and it is absolutely not bound to any website or cloud appliance whatsoever. This way you can have a 3D rendered PCB and you can also develop a corresponding case around it for 3D printing or integrate it to any other electrical or mechanical product. FREECAD is in itself a good CAD software compatible with a lot of widely used CAD file formats, so it probably worth a peek. I’m using all this in LINUX and it works very nicely !